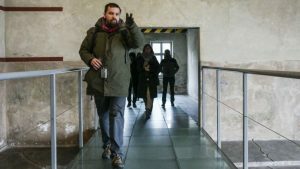 OSWIECIM, Poland (JTA) — Long before he moved here to become the spokesman for the Auschwitz museum and lead its social media effort, Pawel Sawicki’s life was intricately connected to this sleepy town near Krakow. A Warsaw-area radio journalist, Sawicki used to visit Oswiecim as a boy on holidays to stay with his grandparents and play with his cousins, who had moved to the town shortly after World War II. Amid a renewed wave of interest in the Holocaust in recent years in films, books and other media, as well as in visits to the museum — it registered a record of more than 2 million entries last year — the “instrumentalization,” trivialization and denial of the Holocaust has been growing as well, Sawicki said.